Each report/campaign statement covers a specific period of time. 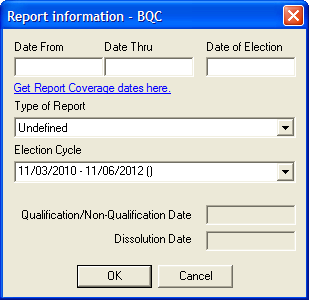 This represents the coverage dates of the report/campaign statement and is entered into the Reports Information screen. 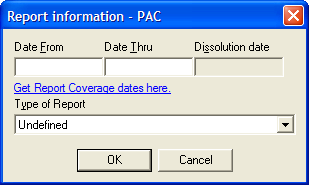 Other report/campaign statement specific information is entered in the Reports Information screen such as the type of report/campaign statement to be filed. Note: Committees must select the correct election cycle for the software to calculate cumulative totals properly. Under the View menu select the Reports tab. Select the Add New item icon on the toolbar or Right click within the tab and select New to activate the report information screen. Select Ok to save the entry and close the window. Select Cancel to close the window without saving the entry. 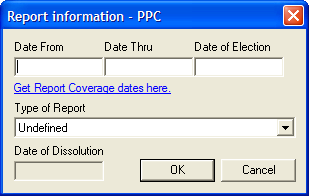 To Modify select an existing report and right click to select modify. 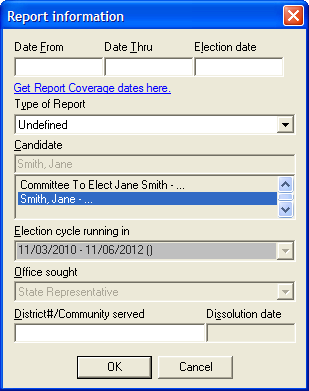 To Delete select an existing report and right click to select delete. Please note closed reports cannot be deleted.